So it feels noticeably more fresh fruit skewers you can store in the fridge before poured sauce. Sate fruits you can also serve it as a dessert or new snacks for you and your family. Once finished, do not forget to divide into another family yaa ... that they feel a snack menu or your new cover. If they like it you can use this recipe as a new area of ​​your business. Immediately apply and good luck! 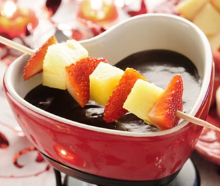 0 Komentar Untuk "How to Make a Fresh Fruit Sate Scrumptious and Healthy"